"Socialism is tyranny based on good intentions." I frequent this business about once a week to drop-off and pick-up my wife's work clothes, and I often have a good laugh at their ever-changing clever sayings, plays on words, pop culture references, idioms and colloquialisms. In fact, they are famous in this town for their very memorable and quotable water cooler content, not to mention their exceptional service. However, they have never gotten very political until now. They sometimes put up a silly jab regarding the economy or what in the world those guys in Washington are up to, but nothing at all like this. Tyranny is defined as arbitrary or unrestrained exercise of power; the despotic abuse of authority; the government, a state or rulership of a tyrant or absolute ruler; oppressive or unjustly severe government; undue severity or harshness; a cruel or harsh act or proceeding; or an arbitrary, oppressive, or tyrannical action. This public proclamation on the adamantine connection between socialism and tyranny really struck me and made me stop and think, and compelled me to stop and snap this picture for posterity. What really made me think was trying to recall the last time I had seen a local business or large corporation openly make such a profound statement regarding the driving force behind the fundamental transformation of this country of ours. I emailed a letter to the owner expressing my support, and attached it below for your consideration. I hope that you will also do likewise and stand behind the people and business owners (the real job-creators) in your community who are standing up for the truth and not hiding behind the approved spectrum of debate, which is the incrementally destructive melody of the Pied Piper. 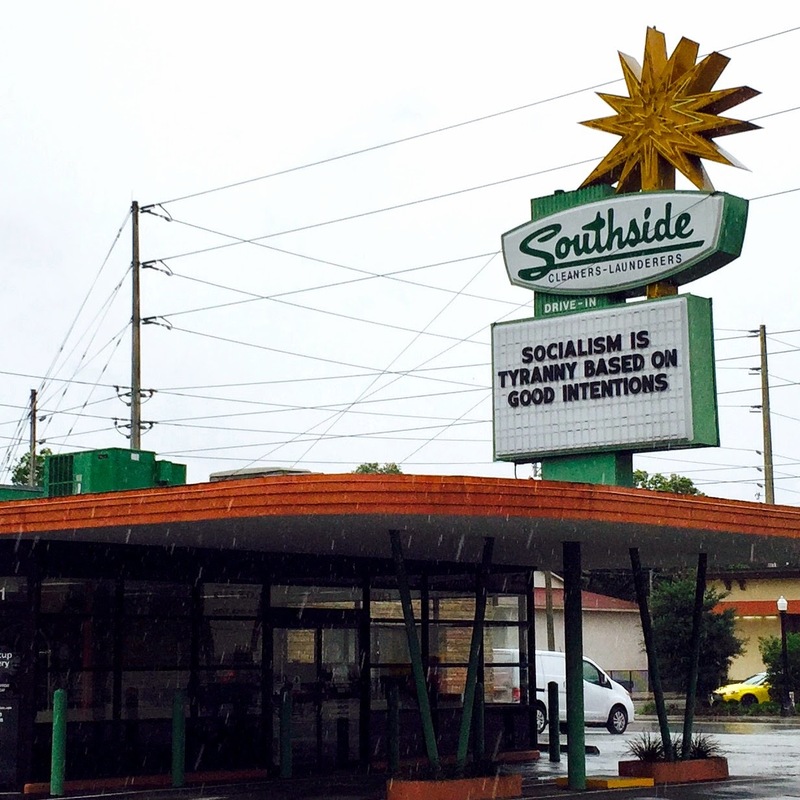 I wanted to offer you due praise for your current outdoor sign message: "Socialism is tyranny based on good intentions." As a self-taught student of history, economics and sociology, I can see exactly what is being done to our once-great Constitutional Republic, and can predict with absolute certainty the direction we are being led by domestic enemies who have infiltrated our government, unless otherwise averted. Today we have every single so-called "official"—from the President of the United States on down to the public school teacher, and every media pundit and news anchor in-between—employing deceptive psychological warfare upon the American people, trying to convince us that we are not a sovereign Republic but a social Democracy. These talking points are being fraudulently promulgated even though all of our original framers decried a pure democracy as the political arm of an aspiring tyrannical government. Those who don't know history truly are doomed to repeat it. These men who formulated our original founding documents, charters and compacts were wise and learned men, and had deduced from studying history that the socialist states that had arisen by force of arms (Babylon, Egypt, Greece, the Roman Empire, and later, pre-revolutionary France, Soviet Russia, Nazi Germany, Maoist China, etc.) ultimately collapsed under their own weight and inability to sustain themselves. With that said, the entire socialist Eurozone is teetering on the edge of a soon coming great collapse. As Vladimir Lenin, the Soviet Premier who gave form and purpose to the modern socialist ideology, said candidly, "Democracy is indispensable to socialism." And revolutionary socialist and author of the Communist Manifesto, Karl Marx, enunciated that "The meaning of peace is the absence of opposition to socialism." So, considering the ever-growing influence the United Nations wields over us, an unelected foreign governing body of elitists, and considering the socialistic political aspirations, purpose and vision of its founders—not to mention Alger Hiss, the convicted communist Soviet spy who penned the Charter of the United Nations—yes, tyranny is the ultimate inevitable outcome. And the so-named U.N. "peace-keepers" are actively engaged in eliminating the opposition to their world-wide socialist vision. Also, considering the estimated 162 million Christians, conservatives, moralists, ideologues, intellectuals and anti-establishmentarianists who went against the system, who were subjugated and genocided under the tyranny of the international socialists, if their modern-day posterity are not successful in altering that vision, then we and our children are in for the fight of our lives, and the "Great Experiment" of our founders will have failed—the experiment which asked the question: Are Americans willing and capable of discarding the shackles of slavery and governing themselves? "Good intentions" is always the ruse; the window dressing; the Wizard of OZ; the exoteric method of diverting the people's attention from the real underlying goal and gaining their trust in order to betray them behind the veil of secrecy. "Pay no attention to that man behind the curtain," said the magician who employed sleight-of-hand to manipulate his emerald kingdom. "For the children" and "For your safety" are also very popular Trojan Horse phrases made famous by the likes of Hitler, Mao, Ceausescu, Stalin, Mussolini, Pol Pot, most recent U.S. Presidents, politicians and NGO's, and is gaining more momentum under the devastating ignorance of the growing numbers of low-information voters. And events which precede those mantras arealways used as pretexts to infringe upon our Creator-endowed rights under the guise of the law and of national security. All governments are inherently as George Washington rightfully explained, not to be trusted; they are "Force! Like fire ... a dangerous servant and a fearful master." And I believe that more and more Americans—especially small business owners who are in the most prescient position to experience the first fruits of the agenda—are coming to the full realization of the truth that is lurking behind the facade of "democracy," which is indispensable to socialism. It is the gradual de-industrialization and democratization of the West, the redistribution of wealth to the East, the building-up of the third world to engineer an even playing field. And ultimately the agenda is about the elimination of a strong, enlightened, politically active, aware and prosperous middle class, which has always been the main opposition and roadblock standing in the way of the social engineers and revolutionary change agents throughout history. For a deeper understanding of the playbook for this agenda, look up the Pincers Movement by communist theoretician, Jan Kozak, a member of the Secretariat of the Communist Party of Czechoslovakia, who was the first to outline and implement its political principle of "pressure from above and pressure from below," the squeezing out of the middle class leaving total government in its absence. I have no doubt that you are a very well-informed person, but I hope that this letter further fleshes-out a few elusive data points from my studies for you to consider. I am a dot-connector. I connect the dots and join the scattered puzzle pieces of information in place to see the bigger picture and analyze a more broad perspective of the world. Let us hope that more Americans venture to do the same before it's too late. Thank you again for being one of the few who are not afraid to tell it like it is, and for standing under the banner of truth in this age of deception when a vast majority are submitting to the discrediting socialist narrative of perception management, whose modern extension is "political correctness," a detriment to Freedom. Previous Why is the US Army Having Cadets Wearing Women’s High Heels? Next What is Nullification? Who can do it?